My guest post on Warren Pearce’s new blog Making Climate Social is now live. That blog is linked to Warren’s research project on the climate debate as viewed through social media. I took part in an interesting ‘Discovery Day’ with a variety of colleagues earlier this year, coordinated by designer and technologist Mathew Trivett, who describes the day here. 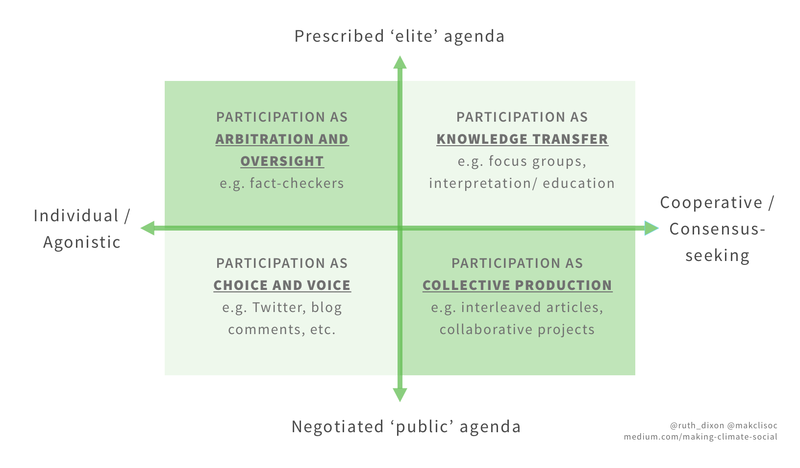 Taking inspiration from a typology of public participation in policy-making developed by Rikki Dean, I try to classify four ways in which individuals participate in discussions about climate change. These four ways of participating are characterised by their positions on ‘negotiability’ and ‘sociality’ dimensions (see Figure 1), and each has its own conventions and etiquette. Recognising and celebrating these different types of participation may(!) contribute to more constructive climate discussions.